I received an error for "Crossed License Limits"
New Entry in Module (Instant) - Triggers when any entry is created in the specified module. Note: Requires a Zoho plan of at least "professional". 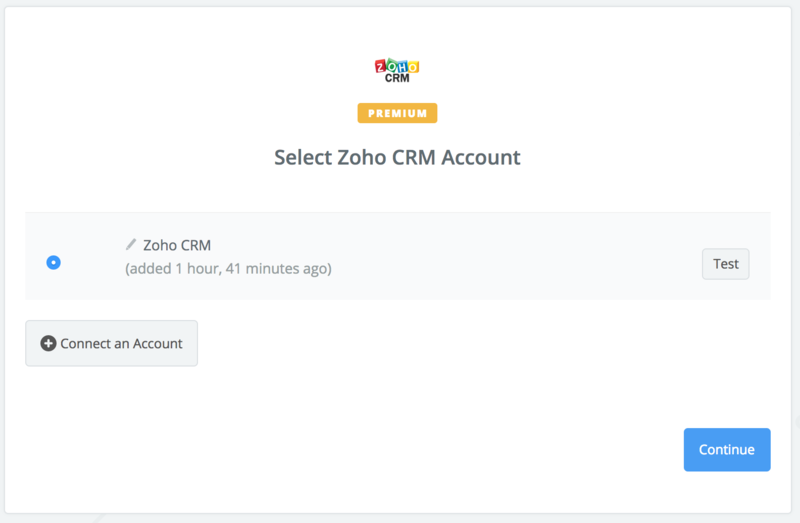 New User - Triggers when a new active user is added to your Zoho CRM account. Create Entry in Module - Creates a new entry within a specific module. Custom modules are only supported for those on Zoho's "Enterprise" plan. 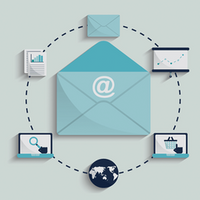 Find Lead - Finds a lead by email address. In this dialog you will need to select your Zoho Account's Domain. You can find this by checking your browser's address bar while logged into your Zoho Account. 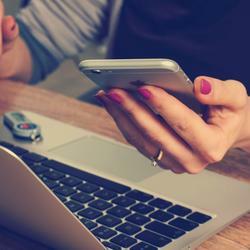 Finally, your Account will be tested and, if everything works, added. 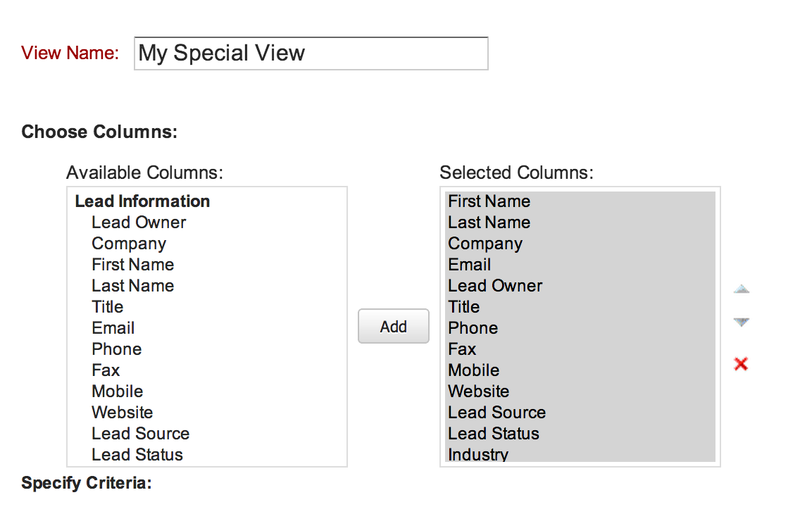 Custom views allow you to trigger on very special circumstances, for example, when a lead has a particular status or custom field value. 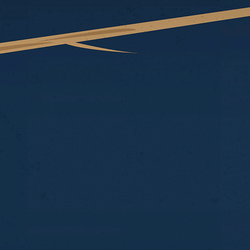 They are very powerful, and Zapier supports them 100%! 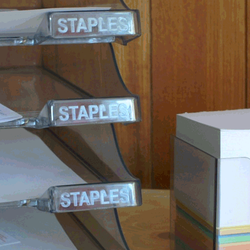 Next, you'll want to include all the information you'll need in Zapier. For convenience's sake, we've just selected everything! We add our own filter in that only records modified in the last day are triggered, so you might try editing a record really quickly to ensure you have a sample set to work on in the next steps! The "New Entry (instant)" Trigger on Zoho CRM is super handy as it allows you to get instant triggers of any module. To do use this you will need to use Zoho's automation & webhook feature (Enterprise only). 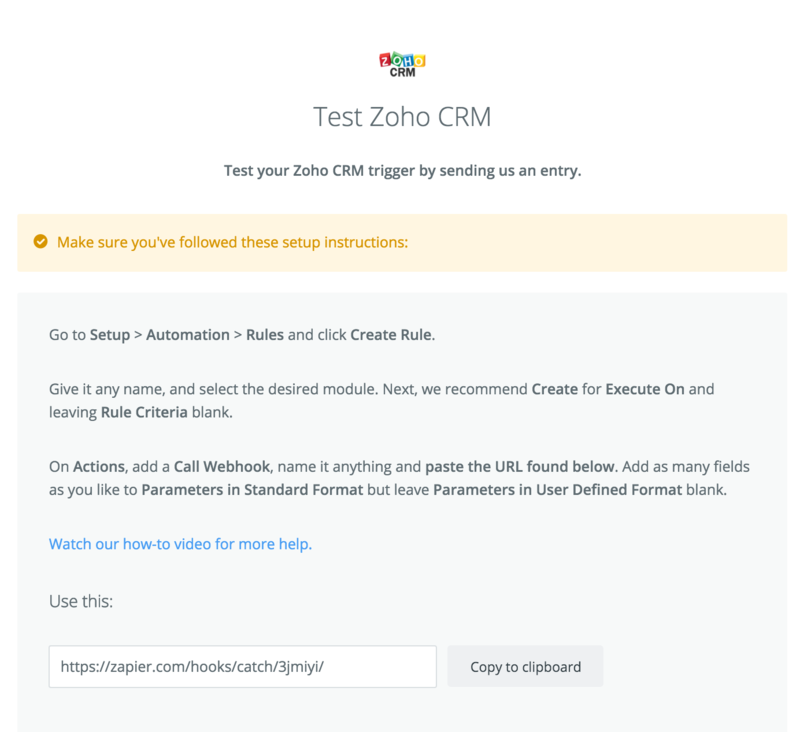 First start creating your Zap with this Trigger and connect to Zoho CRM when prompted. 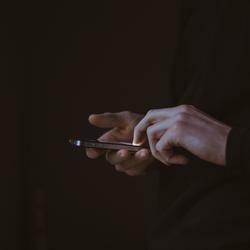 You'll see a screen appear with a webhook URL that you'll need to copy and paste. Click "Setup" from the Top Menu. Under the "Rules" tab, click Create Rule. Choose your module from the drop down, then give your rule a name before clicking "Next"
We recommend Create for Execute On and leaving Rule Criteria blank. 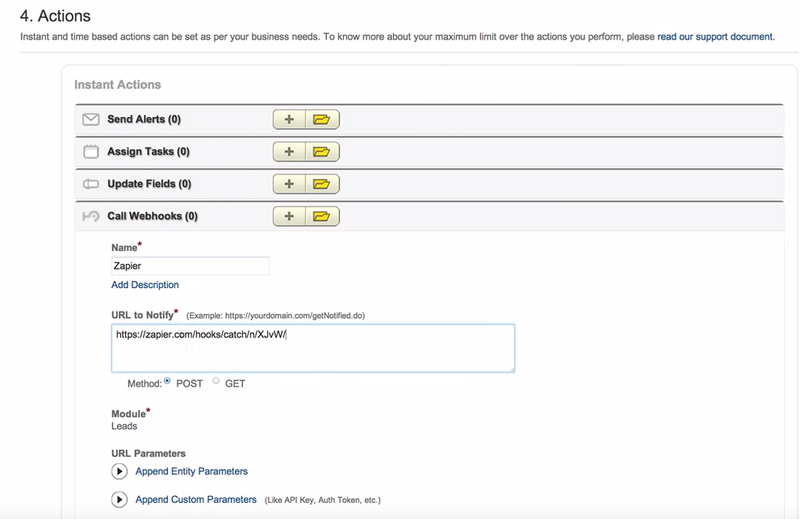 On Actions, add a Call webhook, name it anything and paste the URL found on your Zapier account. Add as many fields as you like to Parameters in Standard Format but leave Parameters in User Defined Format blank. You can find more information on Workflow rules on Zoho CRM's help pages here. You can find more information on managing Workflows on Zoho CRM's help pages here. You will need to create an auth token here: https://accounts.zoho.com/apiauthtoken/create?SCOPE=ZohoCRM/crmapi. 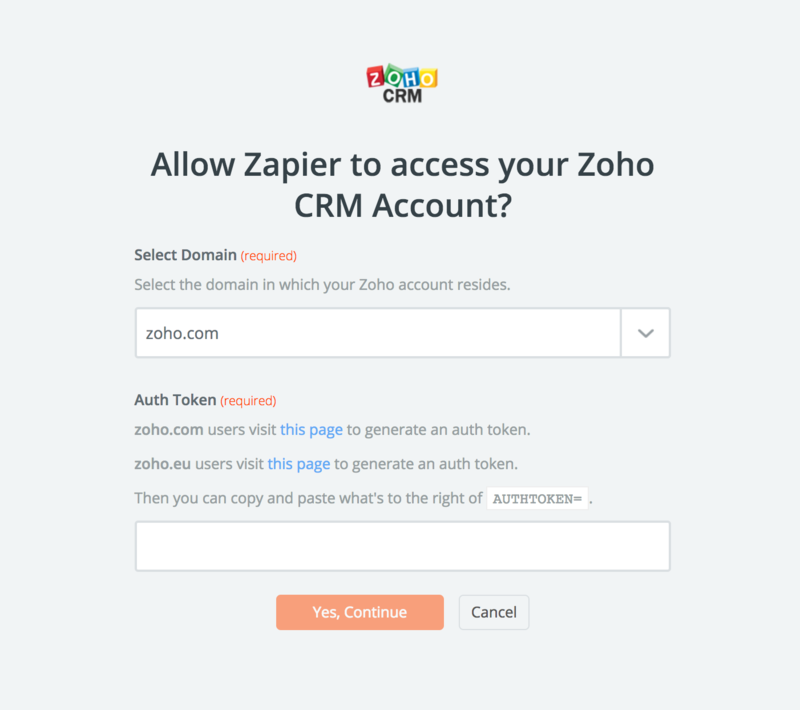 If it still doesn't work, you may also need to contact your ZohoCRM administrator to enable API access. Custom Modules are not currently supported by this trigger. 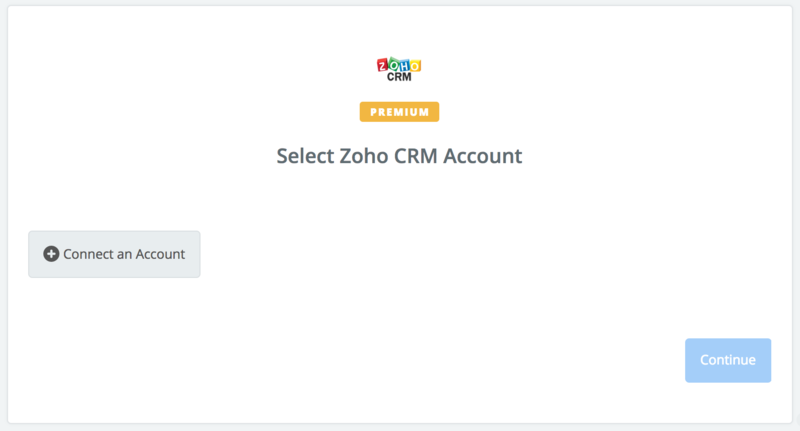 Zoho CRM's API limits you to the standard modules listed here. If this is not set, it will default to "stop". 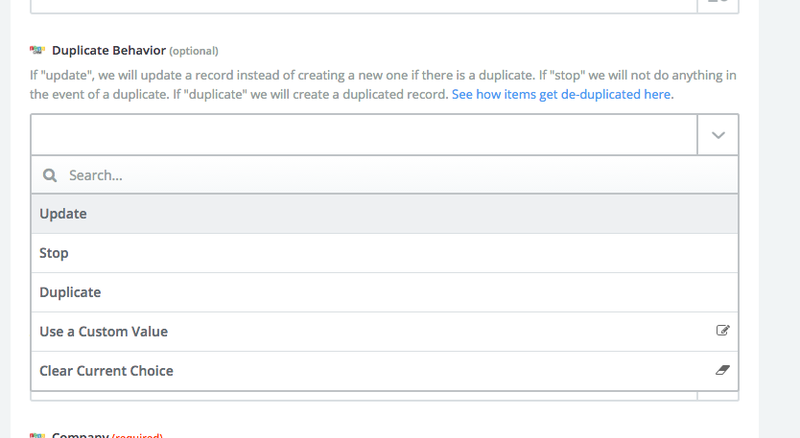 If you have that set and you are creating records which share the same email address, Zoho often catches them in their deduplication logic (even if you've moved one of the records to the trash but haven't deleted it permanently!). To fix this, make sure to delete any existing records that share the same deduplication key (email address is the most common one). If you want to turn this behavior off by default, you can follow these instructions. That is because Product Details and a few other fields are Related Fields in Zoho. We don't support these in Zapier yet. 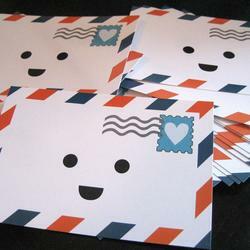 (More on what these are is at this link.) We try and hide them where we can but they pop up occasionally. 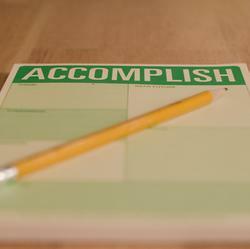 We recommend using a different free text field to apply miscellaneous details for the record as a workaround for now. 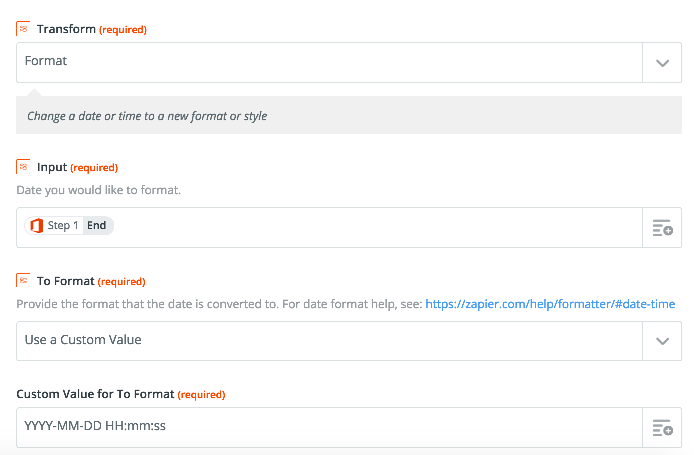 We have a couple feature requests for related fields; write to contact@zapier.com to get notified if/when support is available. 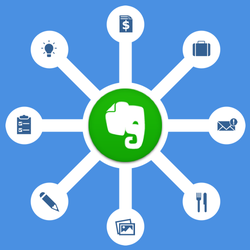 Plan issues - some workflows are only available on the Enterprise plans in Zoho. Permission issues - some workflows are created by other users, or non-admins are trying to trigger them. Zoho generally won't allow this. 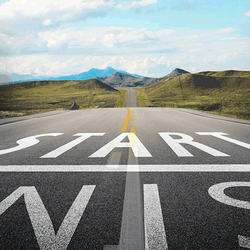 Check to make sure that you are on the Zoho Enterprise plan. Also, check to make sure that the Zoho user connected to Zapier has permissions to trigger workflows. If the previous steps don't give you the account owner's email, you can use the Formatter to create a lookup table and then pass the output of the lookup table to Zoho.